Advances in Botanical Research publishes in-depth and up-to-date reviews on a wide range of topics in plant sciences. 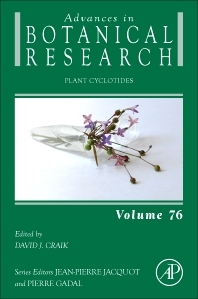 Currently in its 76th volume, the series features several reviews by recognized experts on all aspects of plant genetics, biochemistry, cell biology, molecular biology, physiology and ecology. David Craik is a professor at the Institute for Molecular Bioscience, The University of Queensland. He obtained his PhD in organic chemistry from La Trobe University in Melbourne, Australia (1981) and undertook postdoctoral studies at Florida State and Syracuse Universities before taking up a lectureship at the Victorian College of Pharmacy in 1983. He was appointed Professor of Medicinal Chemistry and head of School in 1988. He moved to University of Queensland in 1995 to set up a new biomolecular NMR laboratory. His research has a particular focus on structural studies of disulfide-rich proteins, and on the discovery and applications of circular proteins and novel protein topologies. He has trained more than 60 PhD students and is the author of 540 scientific publications.